God has a design on your life: to know your purpose for living and to live for him. 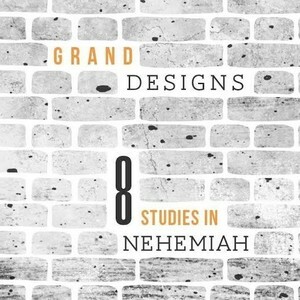 Grand Designs looks at the life of Nehemiah, identifying 8 important steps God uses to fulfil his plan in us and through us as Christ-followers. Nehemiah lived in 445 BC. He was: an immigrant, a person of great influence and responsibility, and mightily used by God. But the main point from this passage is that he was a man who was deeply sensitive to the heart of God. Great things are accomplished through team. Nehemiah realised that to get God’s mission accomplished, he needed more than a heart, more than promises they he prayed about fervently. He needed other people. When God is using us to build something great, opposition can be expected; Leaders are called to bring protection so that the community they're responsible for can flourish. We can do this because it's God's will that this happen. In this preach, Matt gives us a series of helpful things we can learn from Nehemiah's courage under fire. In this episode, Nehemiah and the Jews celebrate the feast of booths, remembering God’s goodness. But this was never meant to be mere nostalgia, and one day Jesus would give it a whole new meaning. We can all identify with the experience of rediscovering something that we’d forgotten about or lost. Often times that brings with it an emotional response. In chapter 8 of Nehemiah we read about 4 rediscoveries that the people of Israel made, producing a strong emotional response of public weeping! When God works with us he does it at the very deepest level, including our emotions.